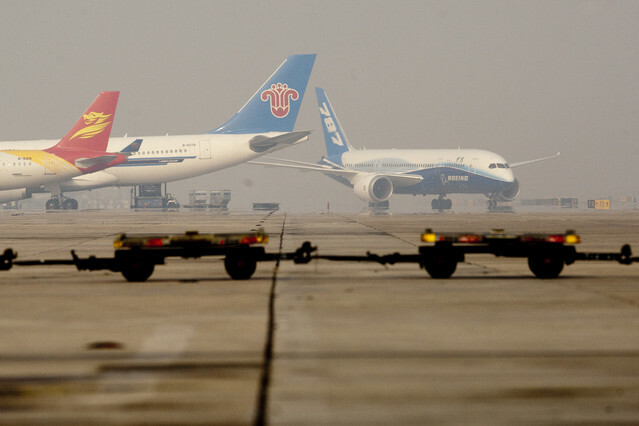 A Boeing Co. 787 Dreamliner, right, taxis past China Southern Airlines Co., second from right, and Hainan Airlines Co. Beijing Capital Airlines jets at Beijing Captial International Airport in Beijing, China. Hainan Airlines Co. (600221), backed by the government of China’s Hainan province, may swap Boeing Co. (BA) 787 Dreamliner orders for larger 747-8s following delivery delays, said Chen Feng, the chairman of its parent. "If it is a good airplane we will consider it because the 787 has taken so long to come out,” HNA Group’s Chen said yesterday in an interview in Beijing. The late arrival of the Dreamliners has caused “a lot of trouble,” he said. The carrier has ordered 10 787-8s, according to Boeing’s website. The airline, which intends to grow its fleet at least 10 percent a year, may opt for the larger 747-8 as China’s economic growth spurs travel, Chen said. A swap would also boost the backlog for Chicago-based Boeing’s biggest passenger plane, which has won 36 orders in more than five years. Hainan Air closed unchanged at 5.10 yuan in Shanghai trading today. It has risen 14 percent this year. Boeing delivered the first 787 to All Nippon Airways Co. in September, more than three years late, because of delays caused by new production techniques and materials. The plane is the first to be largely built from carbon-fiber reinforced plastics. China Eastern Airlines Corp., the nation’s second-biggest carrier, dropped 24 orders for the 787 in favor of 45 737 planes last year, citing delays. China Southern Airlines Co. and Air China Ltd., the nation’s other two big carriers, still hold Dreamliner orders. HNA Group, which also controls Hong Kong Airlines, as well as having investments in airports, retail and shipping, is still interested in acquisitions in Europe, Chen said. The group last year withdrew from talks to invest in Hungary’s now-shuttered state-owned carrier Malev Zrt. Deutsche Lufthansa AG is the biggest customer for the 747-8 Intercontinental, with 20 orders. Boeing has also sold the aircraft to Korean Air Lines Co. (003490), Arik Air and unidentified VIP customers. Boeing expects to complete the test flights needed for the 747-8 to win certification for commercial service within a week, it said Feb. 28. The freighter version entered service last year. The 747-8 has a list price of $332.9 million, compared with the 787-8’s $193.5 million cost, according to Boeing’s website.